Hi Friends! 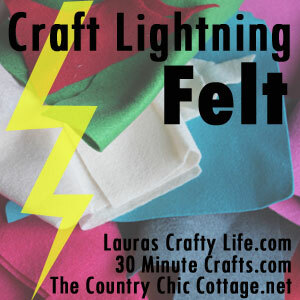 I’m excited to be a taking part of the Lightning Craft group again! This month is all about making projects using felt that are easy and quick to make. I was talking to my kiddos about what to make, and of course, my bookworm daughter said bookmarks and I thought it doesn’t get much easier than felt bookmarks! These are so quick to make and your kids can join in on the fun since kids love to stamp. These felt bookmarks would make great party favors, valentines, teacher gifts or gifts for anyone really! Cut out a piece of felt or you can use a felt square. Cover the whole piece (or whatever section you want to use for the bookmarks) with Mod Podge. Let dry for 24 hours. This just stiffens it up a bit so the bookmarks aren’t so floppy! Use scissors or a rotary cutter to cut out strips for the felt bookmarks. I made them 1-1.5 inch wide by 5.5-6 inches long. You can also use stamp markers and color directly on the stamp so you can have different colors. Also, if the stamp wasn’t colorful enough I just filled in the picture with a marker. 4. If you want, punch a hole in the end and tie a thin piece of felt on it. I cut a thin piece the same way, with a rotary cutter. That’s all there is to it to make felt bookmarks! So easy! Another easy way to make cute bookmarks is with napkins and fabric (click here for tutorial! Want to save this idea for later? You can Pin it now if you like!